What can I use in my products on the Storytellers Vault? 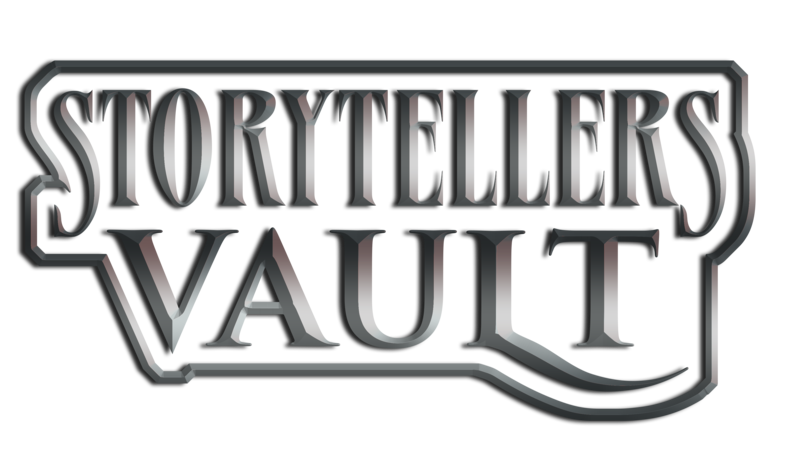 When you create your own title for the Storytellers Vault, you get access to a hoard of resources. Your work can use any of the Storyteller System, Storytelling System, Mind’s Eye Theatre rules, published by White Wolf for World of Darkness, Chronicles of Darkness and Exalted. Or you can create your own custom rules system variants. Products that created with custom, non-traditional rules systems not previously published by White Wolf or its official partners must be stated as such at the beginning of each product for clarity. Additionally, White Wolf and OneBookShelf will from time to time make additional resources such as stock art, template cover designs, music and other such assets available on the StorytellersVault.com site for you to freely use in your Storytellers Vault titles. Can I create Vampire: the Eternal Struggle Cards? Yes. The VtES Custom Card program can be found here: https://www.drivethrucards.com/builder/vampire. Can I use iconic White Wolf characters like Beckett, Lucita, Jonas Albrecht etc. in my Storytellers Vault title? Yes. Any character published by White Wolf is available for use. White Wolf uses Dracula, who is in the public domain. Can I use other characters in the public domain like Sherlock Holmes for “crossover stories”? Yes, but with common sense limitations and will largely be judged case-by-case basis. The Dracula public domain character had the myth adapted into both CofD & WoD in an integrated fashion directly in a way that makes sense because he was a fictionalized version of Vlad Teppes (a real person). Holmes, and characters like him are allowed to be used as a supplement to Mirrors for Chronicles of Darkness. Because that’s what Mirrors is, weird off beat stuff that turns the IP on its head. Can I publish computer games, or apps on the Storytellers Vault? For now, we ask that you publish RPG supplements, fiction, illustrations, comics, graphic novels, and photography only, please. Can I sell my Storytellers Vault title in print as well as PDF? At this time, we are not allowing new print files for Community Content programs. If you have questions about this, please, contact publisher services at matt@onebookshelf.com. Can I create new core monster types? Yes, but with restrictions. You may not create a new monster type as a core game line. You may create a new monster type as supplement for an existing game line, or as part of an existing brand line. For example, you could not make a game titled Zombie: The Eating as a complete stand-alone game. But you could make a product called World of Darkness: Zombies or From Beyond the Grave: Zombies for Wraith, Hunter, Mummy, etc. The best examples of this are The Risen for Wraith: The Oblivion, World of Darkness: Mummy or Chronicles of Darkness: Immortals. TUTORIALS- Tutorials for new publishers, to help you use Adobe Acrobat software to make better downloadable PDFs. QUICK SPECS (PDF)- To get you started. QUICK CHECK LIST (PDF)- To be sure you don't miss anything. EPUB & MOBI EXPORT TUTORIAL - FROM INDESIGN (PDF)- To show you how to prepare your InDesign file for export to the ePub format, and how to use Calibre to convert your ePub file to the Mobi format. EPUB & MOBI EXPORT TUTORIAL - FROM MICROSOFT WORD (PDF)- To show you how to prepare your Microsoft Word file for export to the ePub format, and how to use Calibre to convert your ePub file to the Mobi format. VIDEO TUTORIALS- To enhance your PDF. UPLOAD- Will show you where and how to upload your files for digital download.